I’m worried something is seriously wrong. I had two dental implants placed on my front teeth. They’ve been on for a few months now. While I sort of like how the implant crowns look, the surrounding gums have turned gray. Are the implants causing an infection? Will I lose the implants? The good news is that you’re probably not dealing with an infection. If you were, there would be a fever and pain involved, neither of which did you mention. More likely, the titanium from your dental implants is showing through your gums. This could be from one of two reasons or a combination of both. You probably have thin gum tissue which contributes to it. The placement of the implants is also a big factor. If your dentist isn’t experienced in placing dental implants, he may have placed them without factoring in the depth of your gum tissue. I suspect that’s the issue. Another reason I’m wondering about the skill of your implant dentist is your disappointment with the look of the crowns. But, first, let’s talk about your options for your gray gums. Obviously, your first option is to live with it. If it’s not visible when you smile, that may be acceptable to you. If the gums are visible, then you won’t want to leave them. In that case, you’ll need to have them re-done. If it turns out they weren’t properly placed for the thinness of your gums, you could get at least a partial refund. A second opinion by an expert implant dentist can tell you that. When you have them replaced, you can either get titanium implants again or you can get Zirconia Implants. These are white and more easily masked. These are also great for people who have severe metal allergies because they are metal-free. 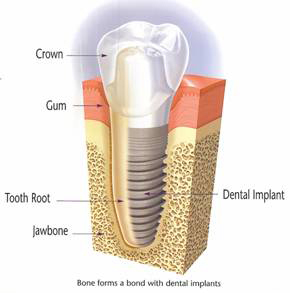 Can Dental Implant Crowns be Beautiful? When you’re talking about getting restorations on your front teeth, it especially important you find a skilled and artistic cosmetic dentist. Ideally, you’d want an AACD accredited dentist. They’re the cream of the crop when it comes to cosmetic dentistry. But, very few dentists are accredited so you may not find one at a reasonable distance from you. In that case, look on the mynewsmile.com website. They only recommend the best cosmetic dentists. Many of them are on their way to accreditation, which is a lengthy process. If a dentist is on their list, they’ll give you a beautiful smile. I am about to finish with my Invisalign treatment. It’s been great and I’ve loved seeing the progress of my teeth. My dentist said I’m going to need to wear a retainer for a time. I’m kind of bummed that after all this time with the invisible treatment I’m going to have to switch to a metal bar. Could I just wear my last pair of aligners as a retainer? I’m so glad you’ve loved your Invisalign experience. They have quite a high patient satisfaction rate. Aren’t you glad we live in the time period we do when we no longer have to wear those uncomfortable metal braces? Unfortunately, your aligners are designed to be temporary. If you wore them for the length of time you’d need to wear a retainer, it would not only wear through with holes, but would get kind of gross and nasty. However, I have some good news for you. You won’t have to wear “ye olde metal bar” for your retainer if you don’t want to. Just like braces, retainers have had their own advancements as well. While these are metal retainers, they’re placed behind your teeth on the tongue side. No one will be able to see them so you’ll get the invisibility you want. You can find two types of these. The first of these are small and cover about half of the tooth, made out of similar material to your aligners, but made for more long-term use. The second covers the whole mouth and can be decorated with a logo from your favorite team or other favorites. What you’ll need to do is talk to your dentist handling your Invisalign case and discuss these newer options. That way you can get the treatment you need in a way you’re comfortable. This blog is brought to you by Dr. Randall Burba. Check out his beautiful smile guarantee. Is a Gray Tooth a Dental Emergency? I have a tooth that’s turning gray. I’ve tried whitening it but it didn’t help. I wondering if something serious is wrong. Is this like a dental emergency? What if I don’t have a regular dentist? A gray tooth is usually a sign that the tooth is dead or dying. Is there a chance that you’ve had some recent trauma to your mouth? That would explain the tooth. You do need to see a dentist soon. You’re going to need a root canal treatment and porcelain crown. If you don’t have a regular dentist, that’s okay. There are emergency dentists. That’s not a specialty. It just means that they’re regular dentists that are willing to see non-established patients in the case of an emergency. This would be what you need. They’ll take x-rays and get a good look at the damage and go from there. Trauma can’t always be avoided unless you’re someone who likes to hang out in front of a ball machine. That’s not recommended. But, certain things, like tooth infections, can almost always be avoided. The key is regular check-ups. There are usually two reasons people avoid going to the dentist regularly. The first is financial. They don’t have dental insurance so they feel they can’t afford it. Most dentists are willing to let you pay out your treatment. You just need to talk to your dentist ahead of time. The second is fear of the dentist. Most dental anxieties start in childhood. Some dentists enjoy helping patients with anxiety. Dr. Burba realized that with patients, their fear stemmed from the shot. That’s why he invested time learning how to give pain-free shots. In fact, most of his patients don’t even realize he’s administered the shot at all. Like your gray tooth. porcelain crowns will not whiten, even with professional teeth whitening. That’s why it’s important to get them the color you’d like them to be when they’re placed. Your dentist can create them to any whiteness you desire. But, you’ll want your natural teeth to match, so make sure you whiten your teeth before the final color of your crown is decided. This blog is brought to you by AACD accredited dentist Dr. Randall Burba.